Loren Hunt’s Guitar Podcast is a wealth of guitar knowledge delivered in a down-to-earth, approachable way. Loren has played guitar since he was a kid in the 80s, and really offers quality perspective whether he’s talking about amps: old-school Marshall tube amps; or guitars: Les Pauls, Strats, Teles, and even newer made-in-wherever guitars; or his pedal rack: Toadworks’ Death Rattle, OCD Obsessive Compulsive Overdrive, etc. Loren has the heart of a teacher (he’s a guitar instructor, too) and his passion for guitars carries over into the podcast. The podcast audio is not studio quality, but it is good enough, and points should be given to Loren for cranking out podcasts in the car on the way to work when he’s busy. Especially if you are a beginner, Loren has a great way of filling in the blanks and extending your guitar knowledge. And even if you are a crusty, road-tested, only-plays-the-blues-in-a-smoky-bar vet, then even you might enjoy listening to Loren dish the goods on all things guitar. Desi Serna’s Guitar Music Theory Lessons podcast introduces a difficult subject: music theory for guitar, and really lays things out nicely. Even if you have avoided theory like broccoli and spinach, well, it is good for you. And Desi’s 11 podcasts can give you a foundation on theory even if you’ve never been brave enough to approach it before. Desi believes most attempts to teach theory for guitarists as if we were playing piano is a waste of time. The first podcast is about scales, chords and progressions. Then once the basic groundwork is covered he dives into the pentatonic patterns and lays out a strategy to practice the shapes and move them up and down the neck depending on what key the song is in. He also gives examples of songs that use each scale pattern he’s talking about. So when he’s discussing the minor pentatonic, he mentions an easy solo to try: Beverly Hills by Weezer. I like how he moves from theory, to practicing the scales, to really playing something. If you listen to all of the podcasts straight through you are bound to have a few of those “a ha” moments when things come together. The audio quality is good and his guitar playing throughout is fun to listen to. He points you to his book Fretboard Theory during the podcast, but he does it tastefully, no annoying overselling. (I bought Fretboard Theory and don’t regret it. –Dave.) The podcasts are a few years old and he hasn’t put another out in awhile, but the information is timeless and worthy of your attention if you are serious about getting better at guitar. Rich and Rich of the Guitar Tone Network are attempting the impossible: to in some small way unearth the hows and whys of electric guitar tone. Cables, wiring, pickups, wood, paint finish, capacitors, tone pots, volume pots, your hands, your brain, and about a million other things define your tone. What do you sound like and why? From the GTN website: “Our hope is to provide you with all the information necessary to understand what creates tone.” GTN does shootouts and high-quality recordings comparing everything from patch cables, true bypass vs. non-true bypass effects, to different high-end Telecasters. Podcasts don’t come out often, but when they do, its fantastic guitar tone insight, with quality audio and production. While other, more prolific podcasters have good episodes and not-so-good episodes, the GTN guys seem to hit it out of the park with every episode. There’s not a bad one in the bunch. One thing I’d like to see from GTN: compare low-end guitars against the upper-end stuff, like a Standard Squier Tele vs. a US-made Fender Tele. A comparison of a boutique custom Les Paul and an original Gibson LP, both costing in the $2000 range is great, but 98% of us guitarists are going to be wondering about an Epi LP vs. a lower-end Gibson LP. 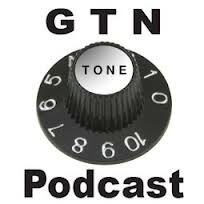 If you spend time pondering your tone give GTN a listen. It’ll open your mind a bit to the possibilities. Podcast #7 Stock vs. Custom wiring, for example, was a real eye opener. It’s amazing how simply changing the wiring, not the pickups, can alter the sound of your guitar. Actually, all of the episodes are eye-openers. It’s a tone chaser party and you’re invited. Hit the comments if there is a guitar podcast worthy of our attention, or you’d like to weigh in on one of the podcasts mentioned above. Hey Gary, Good luck with the new podcast. Can't wait to hear it! 10Should I Buy a Multi-Effects Pedal or Dedicated Analog Stomp Boxes? Should I Buy a Multi-Effects Pedal or Dedicated Analog Stomp Boxes?